U.S. military advisers are central to how the United States fights its wars. After a decade of fighting in Iraq and Afghanistan, U.S. military advisers are now the centerpiece of American military strategy. They may have the hardest job of all. This article is the first of three excerpts drawn from Owen West’s book, The Snake Eaters: An Unlikely Band of Brothers and the Battle for the Soul of Iraq. Hunched over the steering wheel of his Humvee, U.S. Army Staff Sgt. Chris Watson, 26, cursed. His was the last of four vehicles in a tiny convoy headed into Khalidiya. Watson turned on the wipers to brush away the dust stirred by the heaving troop carrier barely visible 10 meters ahead. Through his scratched bulletproof windshield, Watson could see a dozen Iraqi enlisted soldiers, jundis, packed tightly against the troop carrier’s sandbagged walls, their AK-47s swaying like cattails as the big vehicle heaved. Two jundis were perched dangerously on the tailgate. The Iraqi privates were either too junior to claim shelter against the leaking sandbags or too fatalistic to care if they lived. Watson was part of a 10-man adviser team of Army reservists that had deployed to Iraq expecting to teach jundis basic training on a secure, sprawling base with a Burger King, a Green Bean coffee shop, and a fitness center. Their combat tour would consist of posting cellphone videos of Iraqi barracks antics on YouTube. Instead, they were dropped into an isolated Iraqi army outpost in Khalidiya—a poisonous little city between Fallujah and Ramadi in the heart of the Anbar rebellion—with orders to remake themselves as infantry combat advisers, living and fighting as Iraqi soldiers. Team Outcast, left to right: Huss (WIA), Troster, Bennett (WIA), Bozovich. Kneeling left to right: Boiko (WIA), Watson (WIA), Rivera (WIA), Gentile, Neary (WIA). 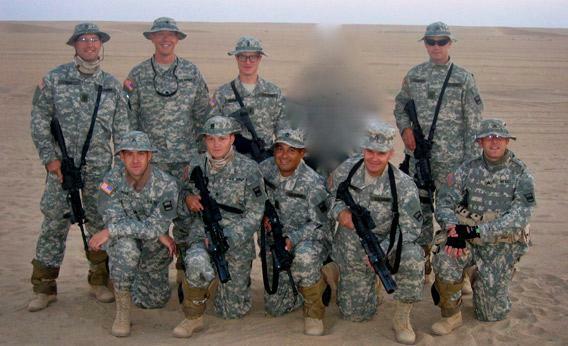 Not pictured: XO (reassigned), Roberson, Blakley (KIA), in Iraq, August 2005. The lead vehicle was a sputtering white Nissan truck carrying the Iraqi patrol commander and his bodyguards. Behind it were two troop trucks brimming with jundis. Last came Watson’s Humvee, which was occupied by two fellow combat advisers. The convoy roared out of the outpost’s barbed-wire gates into “Indian country,” soldierspeak for enemy territory since the Dakota Wars of the 1860s when U.S. cavalrymen from isolated forts pursued indigenous tribes. Watson knew from the single class he’d had on Iraqi religion that there were Sunni tribes in his area and that they hated both Americans and the jundis, who were Shiites, but that was about it. He was more concerned with the awful road conditions. Not that he could see through the dirt cloud contrail the convoy was ripping up. Joseph Conrad’s Heart of Darkness, a cult favorite of Special Forces advisers, describes British gunboats, a century before, bombarding a dark green African jungle—a metaphor for the gulf between two civilizations. In Iraq, the Humvee had replaced the gunboat. In the hot, dusty haze, Watson could barely see through the 4 inches of armored Plexiglas. Sgt. Shawn Boiko, 24, could see better. Standing on the gunner’s platform above Watson, his torso poked through the hole in the roof where the machine gun turret was mounted. A wet cotton T-shirt wrapped over his mouth, Boiko surveyed the bouncing pile of jundis over his 7.62mm barrel. They were younger and skinnier than he expected, and it scared him. Everything about the mission did. On paper, Boiko was expected to “advise” the jundis how to fight like U.S. soldiers. Like the rest of his teammates, he was only a part-time soldier—a flooring manager from California. He figured that before he passed whatever soldiering skills he had on to the jundis, the first order of business was keeping his teammates alive. Vehicle patrols were Iraq’s version of safari. Boiko and his fellow advisers had been told to be on the lookout for anything “out of the ordinary” that might mark a bomb—like teddy bears and fluorescent flags—but it was hard to keep his eyes off the people loitering along Route Michigan, the mustached men in dirty knockoff designer sweat suits and the women hidden inside abayas who scurried nervously into doorways as the convoy passed. There was an air of impending doom. “I’d say ‘watch for IEDs,’ but I doubt it’d do any good,” Sgt. 1st Class Mark Huss, 36, yelled up to Boiko over the engine roar. As the senior adviser on the patrol, Huss sat in the right-hand seat next to Watson. Looking out the blast window, he was horrified by the mounds of trash that hemmed them in on both sides. There was enough garbage littering the macadam to conceal a hundred bombs. Except react. But the three rookie advisers did not know how they would react under fire. They hadn’t experienced combat, and they were not infantrymen, or even regular soldiers. Watson was a cop from Virginia. Huss ran a plumbing company in Iowa. He vowed never again to be stressed by a call about a burst pipe. It was a decision that would be repeated by President Obama in Afghanistan five years later. No matter how America entered its 21st-century wars among the people, all roads out led through advisers and their foreign protégés. These orders had precedent. Throughout the 20th century—from the Banana Wars, when small bands of Marines helped indigenous troops put down Central American insurrections, to World War II, Korea, and Panama—the U.S. military successfully employed similar adviser models. In military jargon, advisers are “combat multipliers.” A 20-man adviser team levers the services of a thousand foreign troops at a sliver of the cost of deploying a conventional U.S. unit. Local forces do their own fighting under the watchful eyes of their mentors. These small bands of soldiers tip the battlefield balance because they are connected to American air, medical, and economic power, and their tactical savvy greatly improves foreign forces. Today U.S. advisers are working in a dozen countries like Uganda, the Philippines, Colombia, and Yemen—quietly and cheaply protecting U.S. interests. In Iraq and Afghanistan, U.S. troops took the lead for years before senior leaders concluded that the locals viewed them as antibodies. Hundreds of thousands of hardworking troops and hundreds of thousands of dollars could not buy their loyalty. The lesson after a decade of fighting is clear: Only local troops can strip guerillas of their anonymity. When entering any failing state, American advisers must be center stage. The problem is, advisers remain a mystery to the American public and misunderstood by its leaders. President Obama has several times declared that advisers are not combat troops. But the exact opposite is true. The adviser’s first job is to fight. This common misconception has its roots in Vietnam. While initially prohibited from direct combat in 1955, advisers in Vietnam became increasingly combat-oriented as U.S. involvement rose. At the peak of the war, there were almost 12,000 advisers. But after the war they became a symbol of mission creep and tactical failure, standing adviser units were swiftly dismantled, and adviser doctrine was discarded as a relic. That proved costly in Iraq. After toiling for months in Iraq while the insurgency spread, it was clear that a new Iraqi Army needed to be built from scratch and mentored by adviser teams. The conventional U.S. military had no trained advisers. 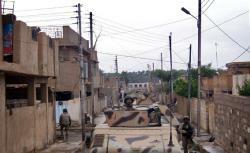 The experts, the Special Forces, had been assigned to raiding units to kill or capture high-level insurgents. Conventional active-duty infantry commanders, in turn, treated the mad scramble to embed small groups of Americans in fledgling Iraqi units like a live grenade. They didn’t want to break their units into autonomous parts, ceding control of their men to alien—and sometimes hostile—Iraqi soldiers. So the adviser mission fell to reservists. When Huss’ team reported to Khalidiya in September 2005, they were told by Marines in charge of Anbar Province that they were supposed to “unfuck the Iraqis.” What that meant exactly, the rookie advisers did not know. They were average Americans handed an extraordinary mission. Somehow they had to build confidence and competence in the Iraqis to take the lead in the war, and ultimately defeat the insurgency, so the Americans could leave. With little understanding of the situation, no doctrine or training on advising to lean on, and zero combat experience to provide rules for staying alive, Army reservists like Mark Huss who, one weekend a month satisfied his reserve duties by teaching soldiers how to maintain laundry facilities, had been shoved into the dragon’s mouth. As they motored down Route Michigan, the wind whipped hot across Boiko’s sweating, goggled face. Every gust swirled up to his turret the stink of piss, feces, garbage, and the wet rotting fur of dog carcasses—the fate of unlucky strays nosing in the sewage and trash for dinner, blasted by bombs. They, too, didn’t know where the explosives had been buried overnight. The city of Khalidiya, home to 25,000 Sunnis, swallowed the four-vehicle patrol. It hadn’t rained for months, but soon the tires were dripping wet from the exposed sewers. The U.S. Humvee slowly followed the trucks into a dark alley. Webs of dangling power lines, like thick ropes of cypress trees, drooped onto the jundis from above. Huss puzzled over the map. Either he couldn’t figure out where he was or the convoy had taken a wrong turn. Should he ask the Iraqi lieutenant in the Nissan? That was hard. He had no translator. The two troop trucks lurched to a stop in front of an empty schoolyard. The only sound Boiko could hear was the light splatter from dripping water tanks atop the roofs. Then the Iraqi lieutenant gave a sharp order, and jundis slowly got down from the trucks, like senior citizens stepping off a tour bus. As soon as the jundis were down, the troop trucks roared out of Khalidiya, leaving the Iraqi Nissan pickup, the adviser Humvee, and three squads of jundis alone on foot in a town that wanted them dead. Where the hell are they going, Huss wondered. Throughout Iraq, standing rules required American vehicle convoys to have a minimum number of vehicles—usually four—in case of the total destruction of one by a mine followed by a small-arms ambush on the others. Huss figured because his team was embedded with Iraqis, these rules did not apply. With two vehicles, he felt marooned in a foreign city. “Correct,” Huss replied as he unsealed the battle-locked 500-pound armor door of the Humvee and headed toward the Iraqi lieutenant. Huss approached Lt. Qatan, the 22-year-old Iraqi platoon leader (Iraqi soldiers used just one name for fear of being outed as American puppets and assassinated). Qatan spoke a little English. Huss had received three nights of Arabic classes in the States. “Hey! This the right place or the wrong place? Good or bad?” asked Huss. “One klick. OK, let’s walk down Route Michigan,” said Huss. Qatan looked stunned. To the American, a grid coordinate on a map was of the most vital importance. To the Iraqi, the map spot was just another unexpected change to accept, like the weather. They were where they were. That was enough. Huss didn’t like it. Idling on Khalidiya’s deserted streets felt as reckless as walking along mined Route Michigan, but it was his first day and he didn’t want to get off to a bad start with Qatan. Qatan shouted and his men began clomping up stairs to get to the rooftops, where they could watch over the town. The residents said nothing. Huss figured the last thing the patrol needed was an American inspecting bedrooms while mothers muttered and children shadowed him, so he turned back to the truck. Coils of kerosene smoke spiraled up from the rooftops. Morning meals? Signal fires? Boiko couldn’t decide. Movies remind Vietnam vets of the war they fought decades ago. For Americans new to combat in Khalidiya, war reminded them of their DVD collections. Was this like the beginning of Black Hawk Down? Huss retreated to the Humvee and again sat in the right-hand seat, sealing himself inside several thousand pounds of armor. His team had been told that to stay alive in Iraq you should stay inside your bulky vehicles. Some jundis, frustrated by their inability to connect with the local Sunnis as they inspected houses, wandered back to their flimsy Nissan, which was bolstered by a few thin steel slats welded on the sides. Others stood in the deserted alleyways, smoking nervously and watching the Humvee, wondering what the hell the Americans had gotten them into this time. Inside the Humvee, Huss pondered the opposite. Why is this on me? In training, the adviser team had been told, “If the Iraqis see your CamelBak, you’re wrong!” Meaning: Never get out in front. The U.S military strategy in Iraq had been made crystal clear to them—transition the war to the Iraqis. They were to lead. Advisers were to, well, advise somehow. Stay in the Humvee, Huss thought. It’s their war. Huss and his teammates had not been selected for their skills, trained to a standard, or given a defined role. It was up to them to decide how to fit in. Huss watched a tired jundi amble over to the Nissan where he used the bumper as a boot rest. The jundis had abandoned any pretense of military discipline. They chatted idly to pass the time like vacationers, oblivious of the dangers lurking in the street. Huss knew nothing about advising. But he’d worn the U.S. uniform for 13 years and he now understood what he had to do. The advice about staying inside the Humvee’s armor was just plain wrong. Huss popped open the heavy Humvee latch. “Where are you going?” yelled Boiko. “Where do you think I’m going?” answered Huss as he stomped back toward Lt. Qatan. Huss was acting on a hunch, but it was a smart one. Special Forces have long followed the dictum “Lead from the rear of the front.” Huss wasn’t SF, but he knew he had to share the dangers with his foreign protégés and give his best impression of a seasoned urban infantryman. He adjusted his body armor and ammo and trotted toward the jundis at a quick, alert glide, like a ballroom dancer. Keeping his rifle tight in his shoulder, he splashed through sewer water, darting among the parked cars and staying as low as possible without blowing out his back, occasionally taking a knee and springing back up. Wherever his eyes went, his rifle barrel followed. When he reached the jundis, his trousers were mucked up to the knees. The jundis didn’t seem impressed. He didn’t realize that they culturally deferred to pomp, not grunt work, whether that was a highfalutin sheikh, a well-fed colonel, or an American adviser out on his first real mission. The soldiers smiled and nodded politely. They didn’t understand a word. Lt. Qatan walked up. “Let’s get outta here, Lieutenant,” said Huss. “We’re in the wrong area.” He didn’t want to insult Qatan by being overly demonstrative, so he checked his motions and voice, like a batter mumbling under his helmet to an umpire. A hunk of shrapnel whizzed like a buzz saw between him and Qatan, smashing apart the wall behind them. His ears throbbing as if they’d been hammered, Huss was knocked flat by the explosion. The mine had gone off next to the Nissan, right where he had just stood, and the alley was whirling in smoke. Jundis howled like wounded animals, but in the haze he couldn’t tell who was hurt. When his ears cleared, Huss heard cries of “Wounded!” and “Dead! Dead!” They knew how to call for help in English. Huss sprinted back to the Nissan. Three jundis inside the blood-splattered cab were sliding around, badly wounded but alive. The soldier behind the machine gun in back had a deep gash across his chest. He was dead. Another jundi slumped against the curb, moaning and holding his blood-soaked arm. Bullets snapped the air. With his blown eardrums, Huss could hear only faint cracks. His pulsating skull was fuzzing his vision. But he could see a nearby jundi shouldering his AK-47 and firing blindly into town. The jundis watched Huss, who at 6 feet and in full battle gear waddled like a football center. Deciding the American’s size afforded them the best protection, a few soldiers huddled behind him and peeked out. Others decided to capitalize on the idea as well and began running toward him, only to be turned away when his hand began swiping at the sky. Perched in the Humvee turret, Sgt. Boiko, the flooring manager, couldn’t believe how calm Huss was. Bullets continued to chip at the neighboring houses while jundis trailed behind Huss, darting like a school of fish mimicking his every move. Boiko had heard of the Iraqi “death blossom,” but here it was playing out. Jundis fired at everything, the way a porcupine sheds quills. Some revolved in a full circle, shooting at everything and nothing. Boiko ducked into the Humvee below his waist. “I can’t see what they’re firing at!” he shouted to Watson, the cop, who urged him to stay down as he eased the Humvee forward to block the entrance from Michigan. The Humvee began to take enemy fire, but Boiko couldn’t see the shooter. He might have been up high in the minaret a block away. The sergeant couldn’t unleash his belt of rounds without positively identifying the sniper in the mosque. There were dozens of rules of engagement for U.S. troops in Iraq, but none as strict as those dealing with mosques. Knowing this, guerrillas often used mosques as weapons caches and shooting hides. Tearing onto Michigan, their Humvee stood at the entrance to the village across the street, Abu Fleis, a sprawl of large ornate homes and farms that was favored by wealthy Baathist retirees of Saddam Hussein’s mukhabarat. A crowd of men in sweat suits, dark trousers, and cheap Western-style dress shirts began to form, a silent jumble of crossed arms and brazen stares. An Iraqi sedan careened out of the alley behind the crowd and sped onto Michigan, pounding along the median and scattering the wild dogs before slowing toward the Humvee. With a whole 15 minutes of experience in the turret to draw upon, Boiko picked up his M-4 rifle and fired into the oncoming car. 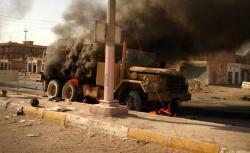 The driver swerved wildly, then slowed and clawed west, toward Ramadi. “I think you got him,” said Watson in his Richmond cop’s drawl. Why had the driver suddenly come closer to a firefight? What was he thinking? Was he thinking at all? Boiko asked himself. The assembled crowd of onlookers didn’t shout. They didn’t spit or throw rocks. They just stared. The loudspeakers attached to the walls of one of the town’s five minarets sprang to life, the imam’s sharp words echoing through the rank urban canyons like waves in a tub. It’s going to be a long tour, thought Boiko. Like most firefights in Iraq, this one ended in less than two minutes. Qatan kept the dead jundi with them, wrapped in sheets taken from a nearby house. He gathered the remnants of his patrol, shushing the occasional outburst of tears. The Iraqis stole glances at their new American chaperones. Huss didn’t know Arabic, but he understood that Qatan was blaming the outsider, the new adviser who didn’t know how to do his job. It confused him. He didn’t think he’d screwed up. By the time the troop trucks arrived to take the jundis back to base, Huss was feeling guilty. Perhaps if he had stayed out of sight in the Humvee the whole time, the jundis would have walked around for a while and left town without incident. When a big Marine Corps wrecker arrived to take the smoking Nissan to the car graveyard, Qatan reacted with stiff pride. “We will take the Nissan back the Iraqi way,” he said. “We don’t need them.” He backhanded the air with his hand. “Well, who the hell called for a wrecker, then?” asked an annoyed Marine corporal. The Marine tow crew was stationed in the nearby American air base, where false alarms along deadly Route Michigan were not easily forgotten. The Marines in the wrecker took in the whole sorry scene and shrugged. Iraqi trucks dragged the broken Nissan along Michigan like a fallen rider towed by a horse. The U.S. Humvee trailed, each of the advisers wondering if they should put a halt to the makeshift operation. Small sparks emerged from the heated axles of the Nissan, then ribbons of aluminum peeled away. Less than a kilometer from camp, the spark shower was so hot that even the hungriest strays gave up the chase. The air reeked of scorched rubber. Flames curled up toward the Nissan’s fuel tank. The jundis jumped from their truck, sawed through the tow straps, and fled in all directions. Fire reached the fuel and flared. Watson threw the Humvee in reverse. “Man, they are all kinds of stupid,” said Watson. “Look at ’em run. Bet they got ammo in there!” He wondered how he could look out for men who could not look out for themselves. The ammo inside the Nissan cooked off like popcorn. It started with a single pop, reached a crackle, and rose to a crescendo, with bullets zinging in every direction while the jundis pressed themselves into the ground and the Americans tucked into their body armor like turtles inside the Humvee. It took an hour for the fire to burn out. After five hours and one death in 100-degree heat, the exhausted patrol limped back to base. The advisers faced a 12-month tour. To a man, they wondered why they had volunteered for such lonely, frustrating duty and whether they would hold up. They were all close to tears but not one cried. As was common in battle, their future civilian lives suddenly burst with potential. They wouldn’t sweat the paycheck. They would be better fathers. If they could just survive 300 more patrols in Khalidiya. Tomorrow: Who Killed Richard Blakely? Can the United States Build a Foreign Army?